A lot has been made about the data-intensive nature of today’s smartphones. iPhones, Blackberries, and Android devices put great pressure on wireless networks, especially with iPhone users on AT&T’s sprecturm in major metropolitan cities. Now with Monday’s annoucement of the Windows Phone 7 devices, wireless carriers will need the additional bandwidth on their networks to handle the data traffic. Although Verizon, AT&T, Sprint, and t-mobile will be rolling out their 4G LTE and HSPA+ deployments in the upcoming months that will alleviate some of the pressure, they are still looking at ways to off-load data traffic to free up their spectrum. In fact, a new study from ABI Research forecasts that mobile data offloading will triple within the next five years. You can already see it in the works now. The introduction of the iPhone three years ago brought radical changes to the way mobile data is being handled now. With iPhone users bogging down its network, AT&T started offering free Wi-Fi access at business partners StarBucks, Barnes & Noble, etc. And at Wi-Fi enabled homes/offices, smartphones switch to use that broadband connection rather than the cellular one. The study finds that about 16 percent of mobile data is diverted from the mobile networks today, and that is expected to increase to 48% by 2015. While off-loading mobile data will increase, the about of data traffic itself will grow by a factor of 30. That means the offloading of data will have increased by 100-fold. Scrambling to maintain the Quality of Service of their mobile data connection, wireless providers have a couple of options: increase network capacity at a great capital cost, or divert that traffic to alternative connections. One such connection utilizes the femtocell technology. Introduced last year, femtocell is a new mobile network architecture that leverages a customer’s broadband connection to improve coverage and off-load data to provide new economical and reliable voice and broadband services. This is a great way to improve indoor coverage when line of sight communication is hindered by buildings or hills/trees. Although these micro-systems are gaining industry momentum, not a lot of marketing has been seen and customer adoption of the technology is still unproven. There is an opportunity to get the broadband and mobile service business from households currently using separate service providers. For integrated service providers such as Verizon FiOS and AT&T U-Verse, femtocells create an adjunct to the mobile service. Operators can increase their overall customer base and reduce subscriber acquisition costs by selling bundled services. As customers move to mobile video, streaming music, and other mobile content, Wi-Fi, femtocell, and media optimization technologies will play specific roles in relieving network congestion. 4G operators need to make pico/femtocells part of the next generation network architecture to reduce cost and economically deliver adequate capacity and reliability. 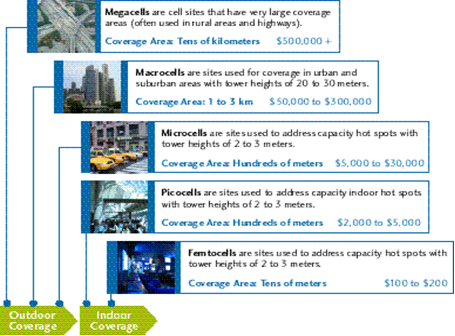 Picocells are merely indoor, single-sectored, low-power antenna that blankets the site with mobile coverage over a broadband connection. Data offloading saves money as well as relieves network traffic. Femtocells do that at a tiny fraction of the per-Gigabyte costs of a 3G network. It adds up to potential savings for the wireless operators.